Every Physiopedia Editor has their own Profile Page. This enables us to credit all work that you do in Physiopedia back to you personally. Your Physiopedia profile is also a great place to promote yourself and your work to clients, colleagues and potential employers, so make sure that you keep it updated! Remember this page is publicly accessible so be professional! To complete or edit your profile follow the steps below. Access your profile page by clicking on your name under Tools in the top navigation bar. If you have not edited your profile before you will you will notice that it has been populated with your short bio (from your account request) and some additional sub-headings. You should now organise this information on the page. 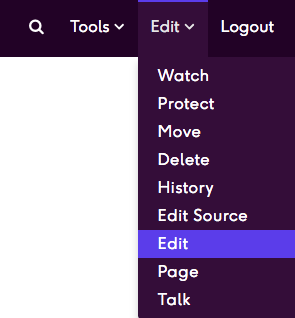 Click on the Edit tab to edit your profile. 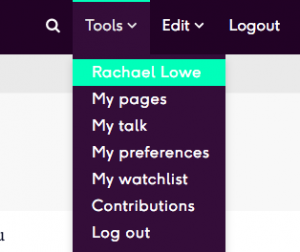 Make changes to the text on your profile page as you wish. Use the icons in the tool bar at the top of the page to style and format the page appropriately. When you are done, click the blue Save link at the top of the page. Top tip: Save often! add at least one link (perhaps to your workplace or published work or presentation).